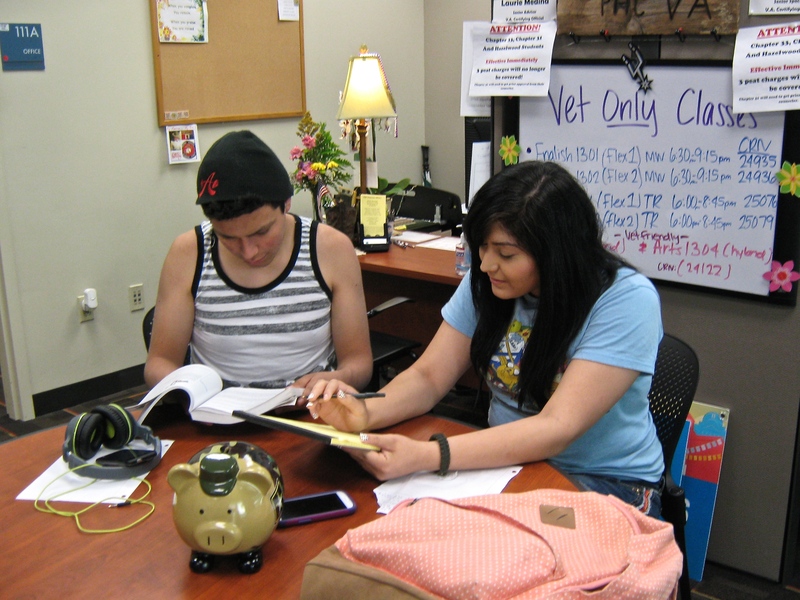 Two Palo Alto College students hang out in the college’s Veteran Affairs Office. Photo by Andrew Olague. San Antonio is known by many as “Military City, USA,” and Palo Alto College, rated as a “Military Friendly School” by Victory Media, is striving to help returning veterans adapt to college life. “We are known to be one of the best Veterans Affairs Offices in the Alamo Colleges, and we are very proud of what we do here,” said Peer Adviser Robert Sandoval. The office helps veterans apply for classes and helps find benefits for those who are eligible. Sandoval said that every veteran knows the benefits that they are entitled to and the Veteran Affairs Office’s job is to make sure they receive them. “My staff and work-studies work very hard to help students eligible for the VA Education Assistance Act and the Hazelwood exemption with the best service possible,” said Retired Capt. USMC Vincent Bosquez, coordinator of Veteran Affairs, who was active duty for 23 years. Entering the office, a friendly and joking atmosphere permeates the room, making the office seem full of life. Sandoval said the Palo Alto Veterans Affairs Office currently assists more than 800 veterans, and 200 of those are sons and daughters of veterans. The office is open on Mondays from 8 a.m. to 7 p.m. and Tuesdays through Fridays from 8 a.m. to 5 p.m. The office is located in the Palomino Center, Room 111. They offer academic counseling and defer any trauma issues to their trained trauma therapist in the Counseling Center (CSSC, Room 200) directly across from the Palomino Center. Palo Alto College’s Veterans Affairs Office is also ranked near perfect on Militaryfriendlyschools.com, a website that ranks schools based on military student surveys. Palo Alto scored no lower than a 3.7 out of 4, scoring higher than University of Texas at San Antonio and on par with Texas A&M-College Station. More information is available on the Palo Alto College website under military or check out their Facebook page. “In one of my developmental math classes, I saw a former student I taught at Harlandale High School. The student was in one of my gifted classes, so I asked why he was here. He responded that he was in the military. He told me how he injured his brain after getting hit by an explosive,” said Trauma Therapist and Palo Alto College Counselor Julie Reynolds. Reynolds called this a TBI (Traumatic Brain Injury). It’s a major problem for returning veterans and is being treated as an issue by the military and, more publicly, the NFL and other major sports when it comes to concussions. TBI is caused by a bump, blow or jolt to the head and can affect cognitive skills and loss of memory. It has been a major issue for years, but it is now being researched in depth. “While we are making progress with technology, we have just begun to discover the way the brain works and how to prevent damage to the brain,” said Reynolds. While Reynolds is trained in trauma, she works toward helping veterans succeed academically and gives insights on their struggles in school. “It’s frustrating having to sit in these classes after I’ve done this type of work in the Air Force for years,” said retired Air Force Tech Sgt. Raul Gonzales, a sophomore Chemistry major. Bosquez agreed. “It’s an adjustment going from combat and military life to the civilian life and entering an academic arena. It takes awhile, and my staff does their best to help them adjust as quickly as possible,” he said. For more information on Palo Alto’s Veterans Affairs Office, contact Bosquez at (210) 486-3113 or via email. The office is located in the Palomino Center, Room 111.